When you start GiftVal, it looks a lot like EstateVal, with entry columns for security identifiers (CUSIPs and SEDOLs) and the number of shares or par. But also available is a drop-down field, allowing you to set whether or not the payments for the lot are to be included or omitted from the report (or the default used — more about this later), and any basis value and date for the security. The core functionality of GiftVal — aside from valuing the securities, of course! — is including or omitting payments. Leaving the drop-down set to "Default" will cause the default behavior for that lot, and the default behavior is set in the program's options dialog. 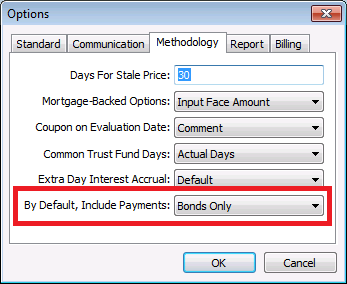 Using Tools > Options > Methodology, you can set the default to either include all payments, omit all payments, or include payments from stocks or bonds only. 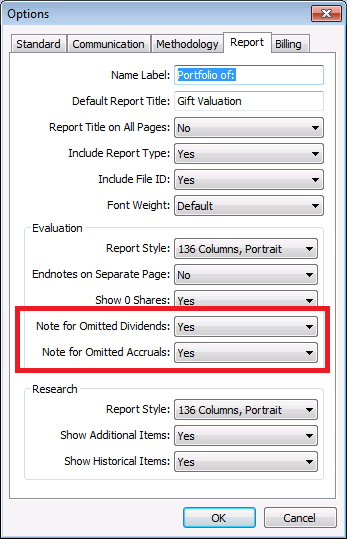 The program's default is set to omit the payments for stocks (dividend interest and principal), since there is usually little time between the ex-date and the record-date, and any dividend checks are likely to arrive to the donor before the paperwork on the gifted security's change in ownership is complete. Rather than require the donor to deliver an additional payment to the donee, the value is simply excluded from the report and the gift. Likewise, bond interest is included in the default configuration, because it's more predictable. But if you want to change from these defaults for a specific lot, you can. Alternately, you can set whether any payment for a lot is included or omitted from the report explicitly by simply changing the drop-down to the desired value. The defaults might be appropriate ninety percent of the time, but being able to modify a single lot is invaluable. Any change on the main lot entry screen to this value for an individual lot overrides the default set in Tools > Options > Methodology, but only for that lot. If a payment is excluded from the value of the gift, it is still shown on the report, according to the preferences set at installation, in the Tools > Options > Report dialog. This makes it easy to see what is and isn't included as part of the value of the gift — payments not included are explicitly labelled "Omitted." But if you prefer to simply leave them off — as if they never existed — you can edit these preferences to change the behavior. Finally, if you enter a basis value and date, they are included on the report as a memo, to give some historical context to the lot. If the basis value is left as zero, the note is excluded. If you have any questions or comments about GiftVal or any aspect of EVP Office, please feel free to contact our Customer Support Department at (818) 313-6300 or Support.